Plot: An elite American intelligence officer, aided by a top-secret tactical command unit, tries to smuggle a mysterious police officer with sensitive information out of the country. Starring: Mark Wahlberg, Lauren Cohan, Ronda Rousey, John Malkovich. distributed by STX Entertainment «Mile 22» in the US movie theaters released on August 17, 2018 and has grossed over $60 million worldwide; dvd and blu-ray release date was set for November 13, 2018. Rent from Netflix and Redbox from November 13, 2018. 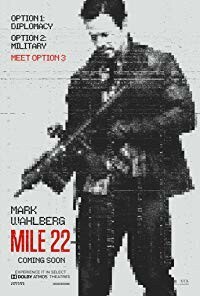 «Mile 22» in the UK released in movie theaters on August 27, 2018. The movie released on dvd and blu-ray on January 28, 2019.